Hay fever season is in full swing, with the emergence of warm and windy weather. 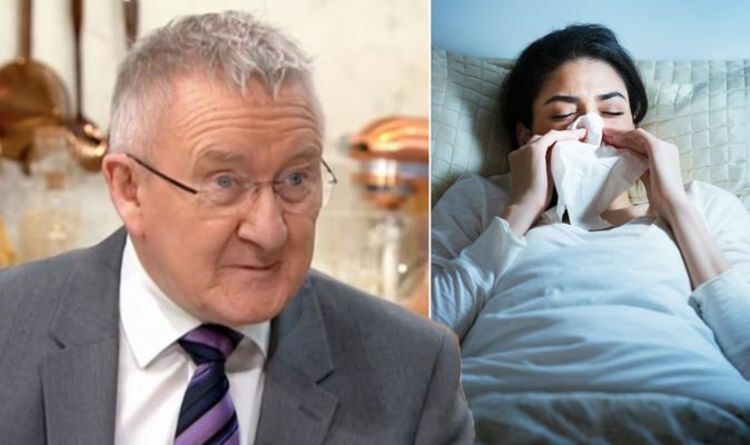 With higher temperatures forecast this weekend, many sufferers will be bracing themselves for the sneezing, itchy eyes and itchy throat that may be triggered. One of the worst times of day for hay fever sufferers is bedtime, when pollen in the air settles. But what can you do to keep symptoms at bay at night? Dr Chris appeared on ITV’s This Morning to reveal seven tips. Alongside his tips, Dr Chris spoke of the hay fever struggles teenagers in particular have at this time of year. He said: “38 per cent of teenagers have hay fever, and half a million face exams this time of year. “Their vision can be affected, their exams are affected. Treatment for hay fever is available at your local pharmacist. They can give advice and suggest the best treatments, such as antihistamine drops, tablets or nasal sprays, to help with itchy and water eyes and sneezing, and a blocked nose. If your symptoms don’t improve after taking medicines from your pharmacy, the NHS recommends you see your GP. Your GP may prescribe you steroids, and if this doesn’t work, you may be referred for immunotherapy. Dr Chris also recommended a natural remedy for hay fever, which is available on the high street for around £8. He said: “Hay Max has had 40 awards. It’s a pollen barrier balm. “Rub it around your nostrils, this catches pollen and acts as a barrier. Experts advise you start taking hay fever treatment at a certain time of year for it to be effective.